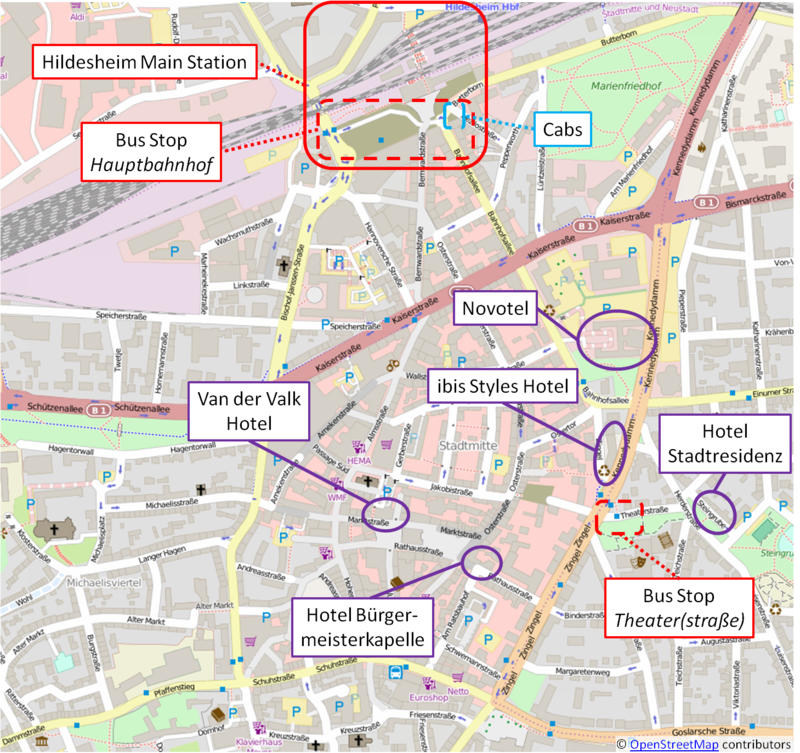 The following map will give you an overview of Hildesheim city center, the main station, relevant bus stations and cabs as well as the hotels. The nearest airport to Hildesheim is located in Hanover. There is the possibility to travel by train with the Deutsche Bahn to Hildesheim. As an alternative to the train it is also possible to rent a car at the airport. By local train to Hildesheim (~60-70 minutes; ~10 euro) and a cab from Hildesheim main station to the event location (~15 minutes, ~17-20 euro). 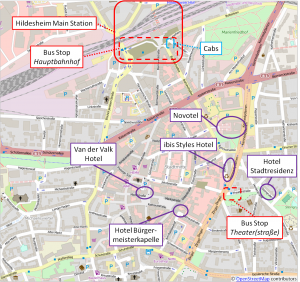 A detailed description of public transport in Hildesheim, e.g., if you do not want to take a cab from Hildesheim main station to your hotel or the workshop location, can be found below (Public Transport in Hildesheim). 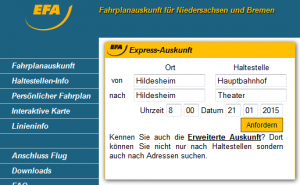 You can reach Hildesheim by ICE or regional passenger train with approximately hourly connections. At the web sites of Deutsche Bahn you can find further information on traveling by train and you can book tickets online. Autobahn E4 / A7, exit at Hildesheim-Drispenstedt or Hildesheim and from there it takes only minutes to reach downtown Hildesheim. Autobahn A2 to the main junction at Hanover-East. Take Autobahn A7 towards Hildesheim-Kassel and exit at Hildesheim-Drispenstedt or Hildesheim. Costs per ticket (single person): 2,30 euro (the ticket is valid for 60 minutes and can be bought from the bus driver). Multi-ticket (5 at once, single person): 10,40 euro (=2,08 euro per ticket) at special shops, for instance at the tobacco shop inside Hildesheim main station. These tickets have to be stamped when entering the bus. Both stations are at the same location as the figure on top of this page shows. In the upper right corner you can fill in the places from where to which you want to go. The figure below illustrates such a search including the required information. You can use the same information as in the figure and just change the time (Uhrzeit) and date (Datum) of your arrival. 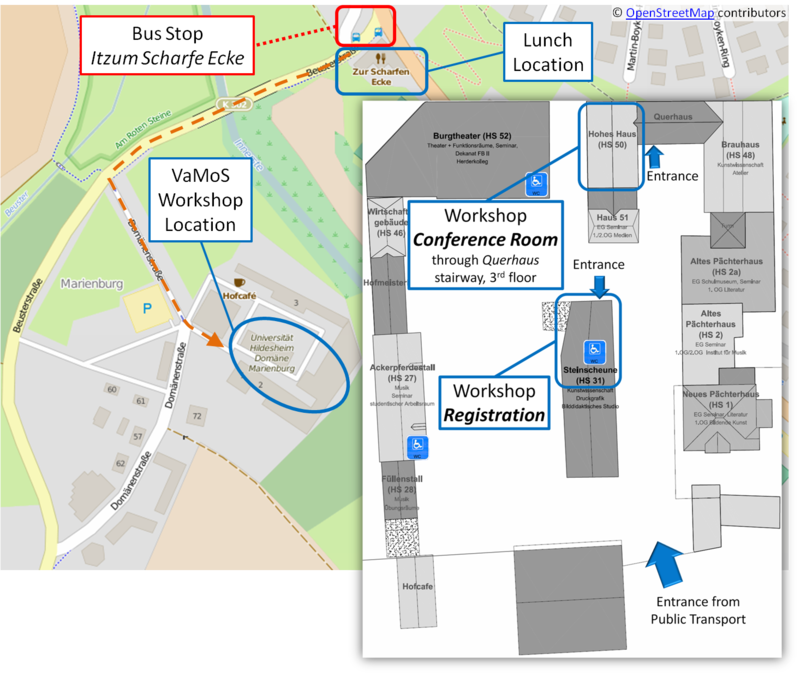 A timetable for the busses that drive from Hildesheim main station to the workshop location can be found here. On the second page of that document you will find the connections from Hildesheim main station to station Itzum – Scharfe Ecke which is the nearest station to the workshop location Domäne Marienburg. 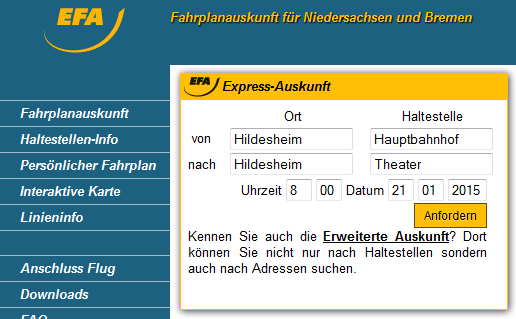 In order to find the best time and bus for your arrival in Hildesheim, you can search for your bus connection at: www.efa.de. An example on how to search for a bus connection is given above (see figure “Searching for Bus Connections – Main Station to Hotels”). 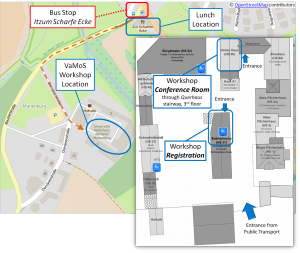 You can go by foot from bus station Itzum Scharfe Ecke to the workshop location. Workshop signs will guide you the way. The following map will give you an overview of the workshop location as well as the bus station and the footpath (dashed orange arrow).